Edge Lane Winding Hole is a minor waterways place minor waterways place place on the waterways major waterways place village town city on the Bridgewater Canal (Main Line) between Stretford - Waters Meeting (Junction of Bridgewater Canal Main Line and Stretford and Leigh Branch) (1 mile and ½ furlongs to the north) and Lymm Bridge No 23 (Lymm, footbridge is next to road bridge) (9 miles and 6 furlongs to the west). 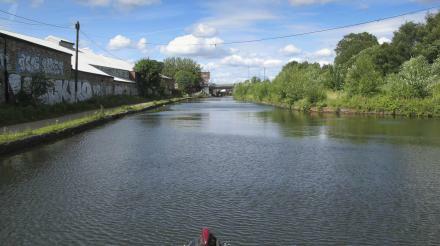 The nearest place in the direction of Stretford - Waters Meeting is Edge Lane New Bridge No 38A; 1 furlong away. The nearest place in the direction of Lymm Bridge No 23 is Watch House Cruising Club; 1¾ furlongs away. Unit 127-128, Stretford Mall, Chester Road, Manchester, M32 9ED — 208 yards to the west. 35 Melville Road, Stretford, M32 8EA — 1380 yards to the northwest. Cooper Street, Manchester, M2 2FW — 107 yards to the southwest. Manchester — 1064 yards to the west. Edge Lane, Manchester, M32 8PX — 598 yards to the east. Oakland House, Talbot Road, Stretford,, Manchester, M320PQ — 1475 yards to the northeast. Citygate 1, Cross St, Sale, M32 8 — 1544 yards to the southwest. Manchester — 1168 yards to the east. Manchester — 1228 yards to the east. Manchester — 1293 yards to the north. Manchester — 1594 yards to the east. M32 8 — 1561 yards to the south. Manchester — 1503 yards to the east. Grange Avenue, Manchester — 831 yards to the north. Unit 51 Upper Level, Stretford Mall Shopping Centre, Manchester — 349 yards to the west. Stretford — 355 yards to the northwest. Manchester — 713 yards to the west. Manchester — 1316 yards to the northeast. 1 kenwood court, Manchester, M328QT — 662 yards to the east. Cross St, Manchester, M33 7JR — 1444 yards to the southwest. 16 Blackfriars Street, Manchester, M3 5BQ — 1002 yards to the northeast. Manchester — 728 yards to the northwest. 51 Wellington street, Manchester — 441 yards to the west. Manchester — 1502 yards to the southwest. 107 Barton Rd, stretford, Manchester, M32 9AF — 573 yards to the west. Manchester — 1512 yards to the east. Gainsborough House, Manchester, M1 6DN — 1306 yards to the northeast. Manchester, M, WA — 1385 yards to the south. Manchester — 1532 yards to the east. Thai Nguyen city, Hanoi — 1191 yards to the southwest. 239 talbot road, Manchester, M32 0YW — 1526 yards to the northeast. All Saints Building, All Saints, Manchester, M15 6BH — 1173 yards to the northwest. Manchester — 1249 yards to the southwest. Chester Road, Manchester, M32 9BD — 306 yards to the northwest.